51% said it’s likely Russia has compromising information on Trump. 79% of Clinton voters think Trump campaign coordinated with Russia; 77% of Trump voters disagree. The investigation into Russia’s influence on the 2016 election and potential coordination with now-President Donald Trump’s campaign has largely divided public opinion. But on one pivotal question from a new Morning Consult/Politico survey, a slim majority of voters are in agreement: It is likely that the Kremlin has damaging “kompromat” on the U.S. president. 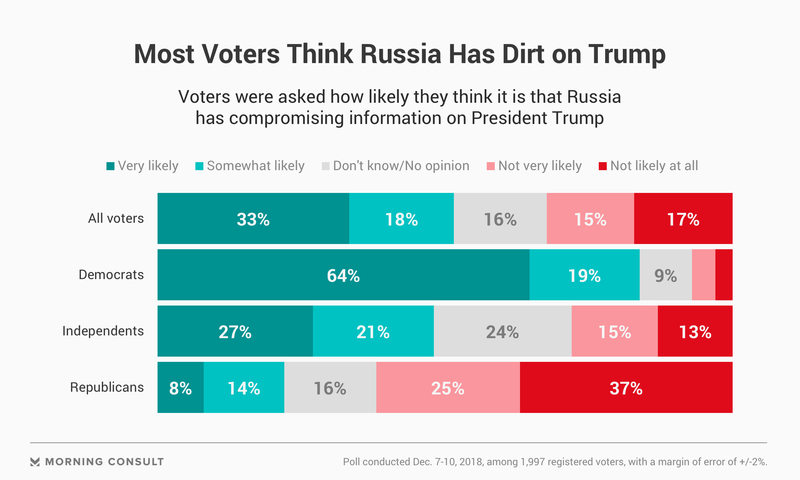 The Dec. 7-10 survey of 1,997 registered voters found 51 percent think it’s likely that Russia has compromising information on Trump, including 83 percent of Democrats, 48 percent of independents and 22 percent of Republicans. Thirty-two percent, including 62 percent of Republican voters and 28 percent of independents, said it was unlikely. Special counsel Robert Mueller’s investigation has been a staple of the news cycle since Deputy Attorney General Rod Rosenstein appointed him to conduct the investigation in May 2017, and Morning Consult polling over several months has found voters’ level of support for Trump often serving as the dividing line for evaluations of the probe. That was the case again in the latest survey, with voters nearly split, 35 percent versus 39 percent, on whether the Mueller investigation has been handled fairly. Three in 5 voters who cast their ballots for Democratic nominee Hillary Clinton in 2016 said the inquiry was being handled fairly, compared with 59 percent of Trump voters who disagreed. And as the president has insisted throughout his first term in office that there was no collusion between members of his campaign and associates of Russian President Vladimir Putin, partisan camps were equally entrenched on the question: Seventy-nine percent of Clinton voters said they believe Trump’s campaign worked with Russia to influence the outcome of the presidential election, versus 77 percent of Trump voters who said he didn’t. With Democrats set to take over the House in January, impeachment proceedings could be on the horizon — especially with the expected impending release of the Mueller investigation’s findings, which could provide impetus for such an action. But a Morning Consult/Politico survey last month suggests a move toward impeachment could be to Democrats’ detriment. The survey, conducted just after Democrats secured their House majority in the Nov. 6 midterm elections, found 33 percent of registered voters thought Congress should begin impeachment proceedings, compared with 51 percent who said it shouldn’t. Those figures represent a net decline of 18 percentage points in support for impeachment since August, when a poll showed voters were equally split on the question at 42 percent on either side. All polls have a margin of error of 2 points.